The choice of Heathrow (T3) for what is supposed to be a budget airline might at first seem odd, but as noted by BTN, and other publications, the difference between the so-called ‘low-cost’ airlines and the legacy carriers is now becoming marginal. With Iberia to Spain, Economy Class passengers even have to pay for (expensive) coffee. Vueling also serves Barcelona, Bilbao, Florence, Galicia and La Coruna from London. At Heathrow it comes under the wing of oneworld and its dedicated check-in area. This will even improve now the airline is about to become a fully integrated part of IAG. Suitably endorsed travellers can make use of the various lounges on offer. Air bridges are provided, and it is the same at Palma. No lugging your person and luggage bits and pieces up the steps. Children are made to walk! Meteor took care of our parking. The service on board Vueling is up to the standard of any other airline operating European short haul flights out of the world’s busiest international airport. You have the choice of three fares – ‘Excellence’, the front row with the middle seat left unoccupied and 23kg baggage allowance. ‘Optima’ puts you at the front end of the aircraft and again with the free luggage. The ‘Basic’ is just what it says, but what you see is what you pay. There are ‘quick bites’ available, snacks, from €4 and a kid's meal at €6. Carlsberg (33cl) comes in at €3.50. Arrival at the completely re-built Palma International Airport is easy through immigration. We chose Autos Roig for our car hire. They are away from the main rental complex on the fourth floor of the parking lot and provided a very easy and instructive handover. You can use a bridge to and from the terminal which keeps one away from the main hassle of passengers seeking transport. We were upgraded to a Lexus Hybrid CT 200, said to be the world’s first luxury dual power compact. Nicely finished and handling well it proved to be an ‘interesting’ vehicle for the visit, the electrics needing getting used to. With a GPS system and rear parking camera it was very easy to use and very economical too. The sloping roof line at the front meant that one had to watch one’s head when getting in and out. Our four nights in Majorca were spent in two hotels, both considered luxury, but each entirely different. 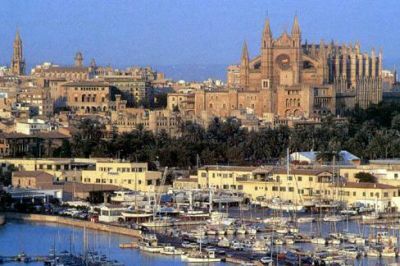 The whole programme was put together by Balearic Discovery, run by Brits long established on the island. It was a very easy way of having a break. 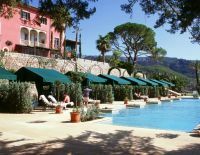 The Grand Hotel Son Net is located on the hillside overlooking the village of Puigpunyent about a 30-minute drive from the airport. 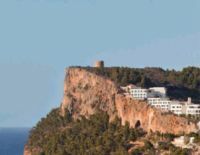 It enjoys a unique position in the south west corner of the island in the middle of the Tramuntana Mountain range, now a UNESCO World Heritage Site. The estate dates back to 1672 and is a spectacular property. In 1998 the former manor house was reopened as a luxury hotel with just 31 bedrooms and includes a private art collection with works by Hockney, Cristo and Chagall. There are two restaurants: ‘Oleum’ inside the main building and ‘El Gazebo’ for outdoor summer lunch. The ‘Oleum’ offers gourmet dining using seasonal fresh local ingredients to produce a menu offering classic Mediterranean cuisine with local Majorcan touches. There is a spa and outdoors a large pool and very restful gardens. A project is under way to construct a bodega where guests will be able to enjoy special events and wine tastings. As part of a long-term plan further vineyards are being planted. Guests in recent years have included the King of Spain. 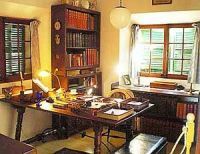 Well worth a visit, just outside the coastal village of Deia on the road from Soller, is the home of Robert Graves (1895-1985), the poet and novelist, one of Britain’s greatest literary figures of the 20th century. He is probably best known as the author of I, Claudius and a biography of Lawrence of Arabia from which the film was developed. His poetry from WWI is poignant. He first moved to Majorca in 1927, and located to the US during the Civil War period and its aftermath. From 1946 Deia was his home, the house largely put together by himself. It has been left in the way he would have remembered from the fifties and sixties. Now run by a Trust, and owned by the local government very proud of its former resident. The property is now overseen by his son Willliam, a retired geologist and wife Elena. He is a fine guide. A 15-minute film in the lecture theatre is worth the small entry fee alone. Eating in Majorca is a joy and naturally fresh seafood is available everywhere. We dined in Palma at marcFosh Tasca Gastrobar, an innovative concept. You can sit up at the long table by the open kitchen and see how your meal is being prepared or choose a traditional table. Watching our midday meal being organised was worth the €13 cost alone. Choose any three items for the lunch. Roasted mozzarella with Catalan Escalibada, Iberican chorizo and orange romesco – a fish dish in a cream source – Chicken saltimbocca with parsnip puré and sage jus – Matcha tea creme brulé with chocolate ice cream – Tiramisu with amarettis crocante. All very light and simple, but you will not go hungry. Our second two nights were spent at the new (into its second season) Jumeirah Hotel and Spa, overlooking the picturesque and delightful Port Soller. Jumeirah means luxury, and this essentially leisure outpost of the Dubai-based brand epitomises opulence. Children are welcome with their own supervised play area. There are three large outside pools, one part of the spa complex where you can indulge in wellness and fitness. There are two restaurants, one more Spanish than the other. Perched on the hillside the building is in fact nearly half a mile long, and with 120 of the most sumptuous rooms. Don’t bother to pull the curtain, just push a button at your bedside. All have what the hotel calls ‘outdoor living space’. Either view – the sea or the lovely mountains. If you are not staying in the area you can take the ancient train from Palma through the mountains to Soller, have a wander around the village square, and then jump onto (or into) the tram down to the Port. Dining in either place is a joy. You can eat Al Fresco in either, by the town hall or on the seafront. Our four-night trip covered but a small part of Majorca. And no rest. The plan is to come back later, see more, and sample the beaches.